Toro Rosso's Carlos Sainz has been cleared to race in Sunday's Russian Grand Prix following his high-speed crash in practice on Saturday. The 21-year-old Spaniard was taken to hospital in Sochi after smashing into barriers at Turn 13, approached at 200mph, but was released on Saturday. Governing body the FIA gave Sainz the all-clear after a medical check. Toro Rosso repaired Sainz's car overnight but have yet to confirm whether they will let him race. Sainz said on Saturday: "My back and neck are just a bit sore from the accident but I'm totally ready. "Hopefully on Sunday I will wake up in good shape and I can try to race." Nico Rosberg claimed pole position for the race ahead of Mercedes team-mate Lewis Hamilton and Williams' Valtteri Bottas. Sainz added he was conscious throughout the incident, in which the circuit's impact-absorbing barriers ended up on top of him after his car came to rest, but added: "Obviously we need to be cautious." The race will start at 1200 BST on Sunday in front of a sell-out crowd in the venue that hosted the 2014 Winter Olympics. 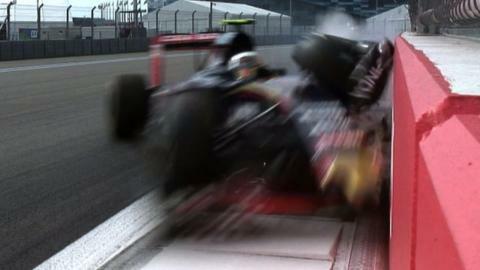 Sainz lost control and glanced the outside concrete barrier as he braked through the difficult kink before Turn 13. The car scraped along the wall, leaving a series of tyre marks, before spearing straight across the run-off area and into the barriers. Mercedes team boss Toto Wolff said that, according to their GPS read-outs, the impact speed was 140km/h (87mph). Sainz's team do not yet have a definitive explanation for the crash, but said they believed it was down to the driver losing control following a change to the less grippy of two types of tyre and altering his brake balance. Team boss Franz Tost said: "A combination of these two factors might have been the cause of the rear tyres locking, which made the car uncontrollable." Several drivers said they were concerned Sainz's car had ended up under the plastic, water-filled Tecpro barriers. Ferrari's Sebastian Vettel said: "It was shocking to see he was so deep in the barriers and that he was covered by barriers." Referencing Max Verstappen's crash at May's Monaco Grand Prix, he added: "After Max's accident, compared to Carlos's accident today, it's very different the way the barriers work, and that's something we need to understand. "The idea is for the barriers not to come on top of you or the car going under the barriers." McLaren driver Jenson Button said that, in those circumstances, the barrier "is not doing what it's made to do, which is slow you down before you hit something hard". He added: "He hit the Armco barrier and pushed that back quite a bit." Red Bull team principal Christian Horner said: "The horrible thing is that he was stuck in the car with the barrier on top of him - very claustrophobic." But Button's team-mate Fernando Alonso, a close friend of Sainz, said: "After a big impact he is OK. Everything did its job, so there are a lot of positives from the accident." BBC F1 co-commentator David Coulthard said the incident would again raise the debate about additional driver head-protection in F1. Governing body the FIA is conducting tests into this area but has so far not yet found a solution that retains F1's open-cockpit nature while not raising other safety concerns. Former Jordan, Jaguar and Stewart technical director Gary Anderson said he felt the accident raised concerns about the the lower noses that were introduced into F1 last year with the aim of improving safety. Anderson said the accident underlined fears about cars 'submarining' under objects they collide with, whether that be other cars or barriers, as a result of the lower noses. However, the lower noses were introduced after extensive research by the FIA and with the aim of reducing the danger to drivers when a car's nose crashes side-on into the cockpit of another car, in a so-called T-bone accident. The FIA considers them the best compromise in the face of all the possible circumstances in F1 crashes.